ABU DHABI: It was a historic moment for the Arabian Gulf as Al Italia’s Boeing B777 touched down on the run way at the Presidential Airport in Abu Dhabi, UAE, from Rome shortly before 10pm on Sunday. Onboard was Pope Francis, the first pontiff to visit a Gulf Arab country in the Vatican’s long history. There was a wait, presumably as those onboard readied themselves for the moment that Christians in the UAE, and the wider Gulf region have been waiting for since the visit was announced in December 2019. Arabic news channels showed images from inside the plane as the Pope met members of the world’s press. As he stepped out of the plane through a jet bridge he was met by the Crown Prince of Abu Dhabi Mohammad Bin Zayed Al-Nayhan. The two spoke briefly before the pontiff was greeted by a young girl who presented him with a bouquet of flowers. He was then introduced to a series of Emirati government ministers and the Grand Imam of Al-Azhar Ahmed Al-Tayeb – the chairman of the Muslim Council of Elders. The presidential airport is a restricted area and security was especially tight, there were no cheers from members of the public, there were no members of the 1 million-strong congregation residing in the UAE nor the 135,000 worshippers who will celebrate a Papal Mass on Tuesday. The pontiff was then led by a delegation into a minibus – in keeping with his insistence on no-thrill vehicles - which took them off to the Presidential Palace escorted by convoy of black security vehicles. 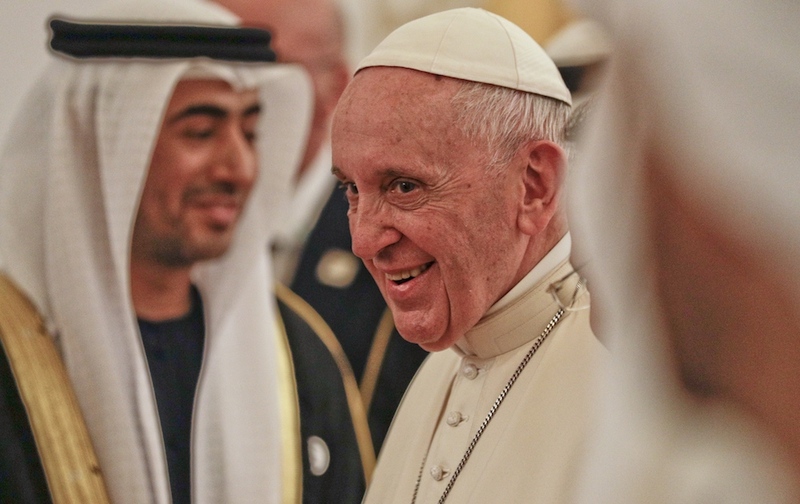 Pope Francis was invited by Sheikh Mohammad Bin Zayed Al Nahyan, Crown Prince of Abu Dhabi, who is set to receive both Pope Francis and Grand Imam Ahmed Al-Tayeb at the Presidential Palace. “Faith brings us together even in the face of differences. It also keeps us away from hostility and indifference,” The pontiff said earlier. Aside from the mass at Zayed Sports City, the visit will include a tour around Sheikh Zayed Mosque and an interfaith meeting on Monday with the Pope and Grand Imam of Al-Azhar with 700 religious figures set to attend to discuss coexistence, tolerance and fighting extremism.